The Search Service Application in SharePoint provides search functionality, as its name implies. We have to use PowerShell scripts to configure search service application from SharePoint 2013 on wards as there is no user interface to configure the Search topology from SharePoint Central Admin - although we can create new search service application instance. 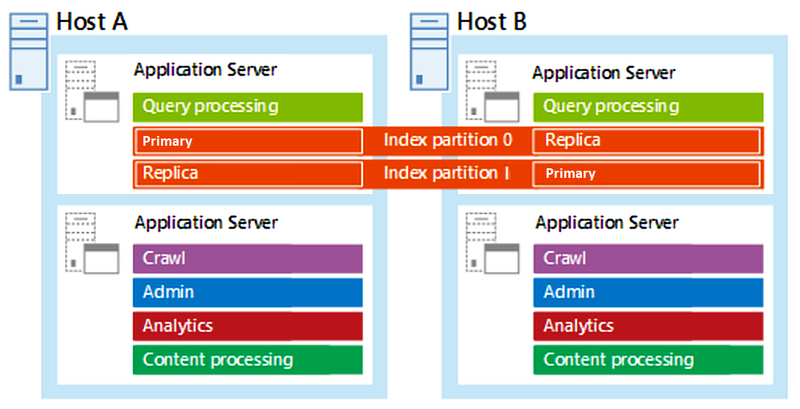 While my earlier article addresses How to create search service application in SharePoint 2013 - Single Server farm, for Standalone SharePoint 2013 or SharePoint 2016 installations, In a production environment we may have to distribute and load balance search components to different servers in a multi-server farm. Since we'll be using multiple servers in SharePoint farm, we can add Redundancy, Performance, and Reliability to the search application by splitting the six search components (Admin, Crawl, Content Processing, Indexing, Analytics, and Query Processing) among them. Also, we will configure two index partitions to ensure both servers have a replica of the search index. Creating Managed account, application pool for search service application. Here is the PowerShell script to create SharePoint 2016 search service application. Copy-Paste this script to PowerShell ISE or any other PowerShell editor (PowerGUI? ), set the configuration parameters according to your environment and run one step at a time! Create folders for Index Location & Replica Location (as in variables: $PrimaryIndexLocation & $ReplicaIndexLocation) on all servers which are hosting search topology index components, prior running the main script! $SearchServiceApplicationName = "Search Service Application"
$SearchServiceApplicationProxyName = "Search Service Application Proxy"
$SearchAppPoolName = "Service Application App Pool"
Write-Host -ForegroundColor Yellow "Checking if the Managed Accounts already exists..."
Write-Host -ForegroundColor Yellow "Checking if the App Pool already exists..."
Write-Host -ForegroundColor Green "Started Search Service instance on $SearchAppServer1"
Write-Host -ForegroundColor Green "Started Search Service instance on $SearchAppServer2"
# Create the Search Service Application, If it doesn't exists! # Create the Proxy, If it doesn't exists! Write-Host -ForegroundColor Yellow "Creating Search Service Topology..."
Write-Host -ForegroundColor Green "Search Service Application has been created. Please start a Full Crawl!" Once everything is setup, You can see the Search topology visually from SharePoint Central Administration site. The above script is for SharePoint farm with two "Application with Search" Server. What if your SharePoint farm has more than two app servers, say Four? Best Practice: Assign Query and Index components together in the same server(s) and place remaining components to other Search App servers. Write-Host -ForegroundColor Green "Started Search Service instance on $SearchAppServer3"
Write-Host -ForegroundColor Green "Started Search Service instance on $SearchAppServer4"
I'm a Newbie, I am constantly exploring online and this one assisted me. Thank you! Amazing ! Thank you for sharing. Great work Salaudeen. Thx for share. Oh this is really good. Thanks for publishing this helpful article about how to configure Search Service Application in SharePoint 2016 using PowerShell scripts, great one. Also, thanks much for sharing the step-by-steps along with screenshots as this is very much useful. I like SharePoint 2016 as this version has released with so many exciting features to give a better user experience. I have a below topology in my sp 2016 farm.. 1 application withwsearch n 2. WFE I have configured the search service in app server n all web application hosted in wfe server .. crawl completed without any error but when I search anything from the site it just rotate the search box then get the time out error ... What should I check?? Any help on this.